Best Black Friday and Cyber Monday Deal to buy your CRM that falls on 24 November (Friday) and 27 November (Monday) respectively this year, are the two biggest spending days of the year for the U.S markets. This implies that there is a massive opportunity for small business, to capitalize on this seasonal frenzied buying spree and generate a huge increase in sales. According to research, most small business views a small increase of sales on Black Friday and Cyber Monday, without much additional efforts, since more than 55% of consumers plan to pay a visit to stores on these two days of the year. In a report published by National Retail Federation on holiday spending in 2013, it was found that 20-40 percent of yearly sales for small and medium businesses take place in the last two months of the year, and this trend is on a rise. With Black Friday 2017 just around the corner, big deals are continuing to pop up on most of the US’s biggest retail online sites, as of today. According to TechRadar the most sold and some of the greatest tech products on discount this year are Samsung Galaxy S8, PS4 Pro, PlayStation VR and CRM platforms. This is to name just four tech products of many. Massive sale discounts on flat-screen TVs and laptops are also pretty typical deals that run on Black Friday and Christmas. These flashy and awesome for the consumer’s deals work on businesses that have big margins or even small businesses those who can justify breaking even to acquire new customers since they are aware that their average customer makes multiple purchases during the later part of the year. As most people use, different social media and web research before purchasing online, it has been found by Salesforce that while 74% of consumers search the website, 43% checks their emails, 38% look into social media promotions and 36% gets motivated to buy using the retailer’s mobile apps. As retailers are struggling to meet the shopper’s desires for providing them unparallel holiday promotions and smart retail experience on this holiday season 2017, here are a few awesome tips that you must know if you are thinking about buying CRM for small business in the next few days to come. Like any other software, you need to train yourself and your employees to use the CRM platform. Hence to save yourself the frustration and headache, choose the CRM which has a simple user interface and does not require much of a learning curve. The best way to be sure about this is to use a test or demo of the CRM software and find out whether it fits your taste. As there is no one-size-fits-all CRM solution for small business or even for large enterprises, customization of the CRM software is the key to getting the most out of your customer relationship platform. Choose a CRM, which can be customized according to your business’s unique needs. Apart from feature customization, you need to also look into the extending capabilities of the CRM by using plugins, extensions, templates, themes, and other add-ons to completely tailor the CRM to your business DNA. Make sure that the CRM that you buy is compatible with the applications that you already use in your office. CRM that integrates with all types of third-party software (like POS system, accounting, call management and others) helps to streamline all your data through different areas of your business without having to switch between different software. Is your business specialized in a certain niche or industry? Many specific CRMs are specially designed for finance, retailers, real estate, restaurants, legal, academic institutions and more. Hence, if you are in a niche-based business primarily choose a CRM that fits your industry before selecting the one that does not. As a small business owner, avoid those that describe them as “on-premise” CRM and choose a cloud-based CRM software. Since, using a cloud-based CRM, you can get access to your CRM data anytime and from any device with an Internet connection, without being forced to access information from the location or device in which the CRM software is installed. Choose a CRM solution in this year’s holiday season new deals that can be accessed from your tablets and smartphones. Having this functionality in your CRM, aids in letting your sales and support team keep up with their work even on the go. As CRM software is one of the core systems for your business operations, choose a CRM platform, which has stringent security measures to prevent cyber attacks and more importantly data loss. CRM solutions do not just help businesses to track information and boost sales but also helps in allowing your sales and support teams to become more efficient in their jobs. 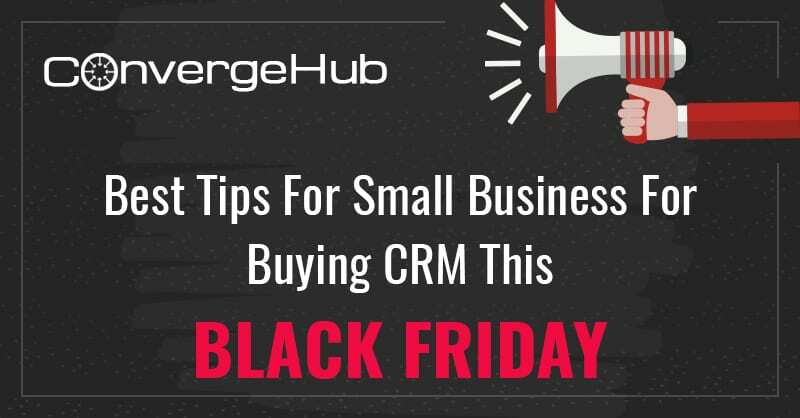 We guess this article on CRM buying tips for Black Friday 2017 sale is sure to help you with considerable information to make your Holiday Season 2017 Customer Relationship Management software for small businesses purchase a runaway success this year.